However, to achieve the impeccable shave time after time, not only do you need to replace the razor blades regularly, your shaving brush needs attention too, keeping it in the best condition for your next shave. This involves cleaning the brush fibres and storing your shaving brush in it’s own stand. Rinse your shaving brush fibres in warm water until no visible cream or soap remains, then shake or ‘flick’ the brush to expel any excess moisture. Take 30 seconds to gently comb out loose bristles and any minor tangles. These simple steps are the ideal way to prepare your shaving brush for drying. It is highly recommended that you hang your shaving brush in a shaving brush stand. Such stands are also known as shaving brush drip stands. Hanging your shaving brush in the upside down position will allow any remaining moisture to work downwards to the fibre ends and evaporate — regardless if your brush features real badger hair or vegan friendly synthetic fibres. Your shaving brush will now be maintained in a dry and clean condition, in preparation for your next wet shave. 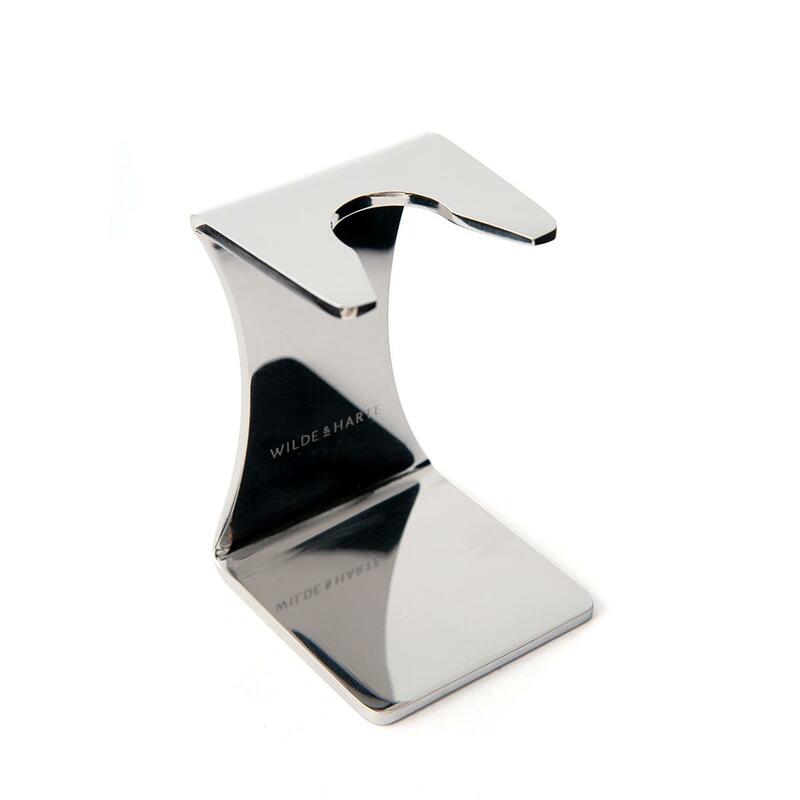 The Wilde & Harte shaving brush drip stand is the ideal way to dry and store your shaving brush between wet shaves. 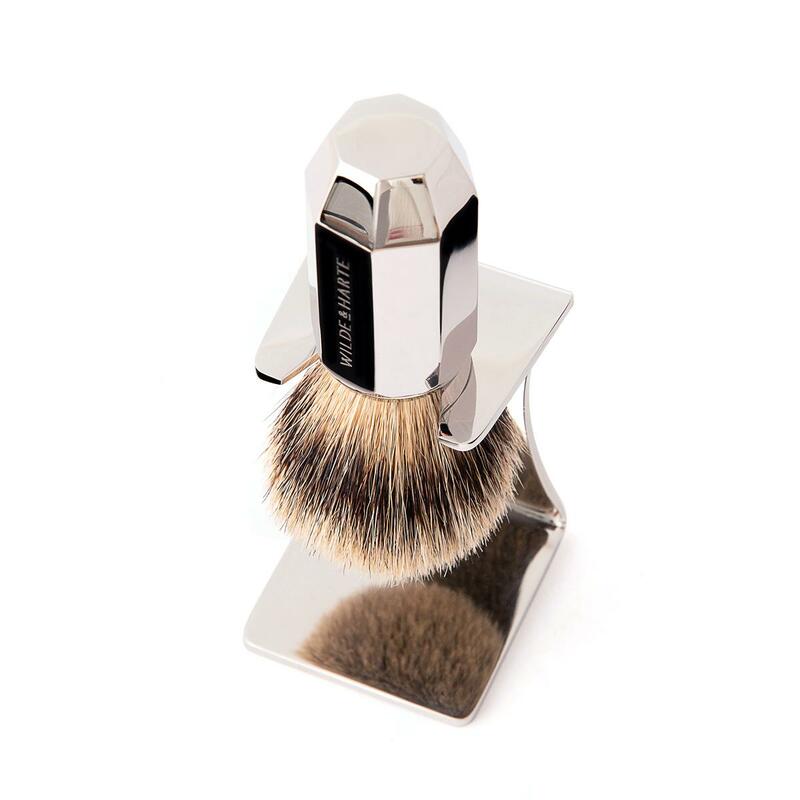 Manufactured from stainless steel, it offers sufficient weight to securely hold the shaving brush in place while it dries. It features a polished mirror-finish and an engraved Wilde & Harte logo. Once a month, we recommend you clean your shaving brush stand. This is easily achieved by wiping the stand with soapy warm water and rubbing dry with a small cotton towel or face flannel. We also suggest this be the method to maintain the mirror finish of your Wilde & Harte shaving brush handle and razor handle. This type of cleansing will not erode the engravings on your items whatsoever. Luxury shaving creams and shaving soaps are available from a handful of leading UK grooming brands. They are available in many traditional fragrances such as sandalwood. Typically, a 150ml tub of shaving cream (£15.00 / $20 (USD) approx.) would last six months, shaving three times a week. A Shaving Brush and Stand — the Perfect Combination for the Perfect Shave! Our shaving brushes are designed and manufactured in Britain. We are proud members of the MADE IN BRITAIN campaign. 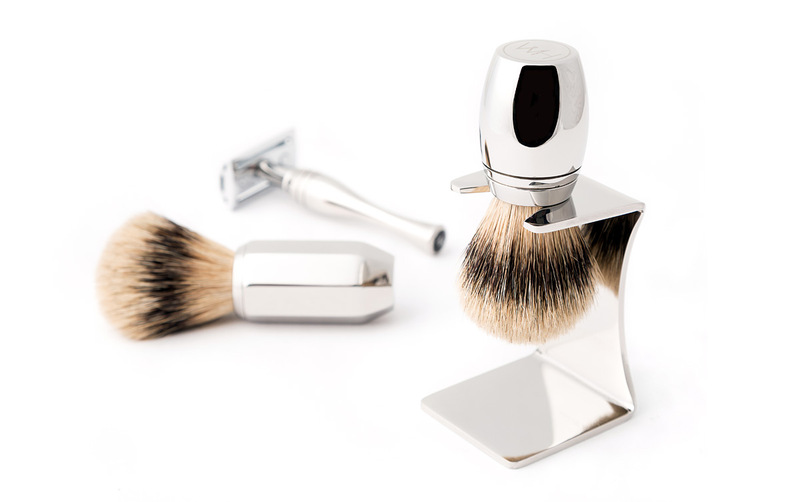 Each shaving brush handle and shaving brush stand is polished to an impeccable mirror finish by skilled stainless steel finishers, before being laser engraved with Wilde & Harte branding. A traditional Art Deco design and an elegant contemporary design. We procure the highest quality 'best' badger hair for our badger hair shaving brushes, offering superior water absorbency for creating a rich and dense shaving lather. Our vegetarian friendly shaving brushes feature the finest high-quality synthetic fibres to match the aesthetic and water absorbent characteristics of premium quality natural badger hair.